Here is another one of our favorites from Sally Fallon’s Nourishing Traditions cookbook (page 586). 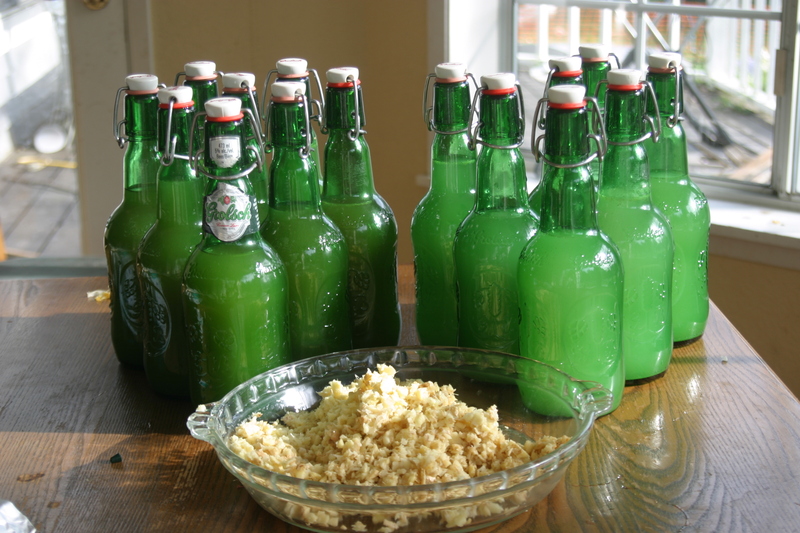 I’ve changed the process a bit from the recipe in the book because I like it when it’s really fizzy. To start with, I don’t take the time to peel the fresh ginger. As long as the root is fresh and in good shape, I think this works fine. After all the other ingredients are in, I fill my jar about half full of water and stir so the salt and Rapadura dissolve. To speed the fermentation along, I add the yeasty dregs of a bottle from my previous batch. At this point, I cover with a lid, and place the jar in room temperature on a plate to catch any overflowing drips. If I don’t have any ginger ale left from before, I leave the jar covered with a cloth so the wild yeasts in the air can start working in the mixture. 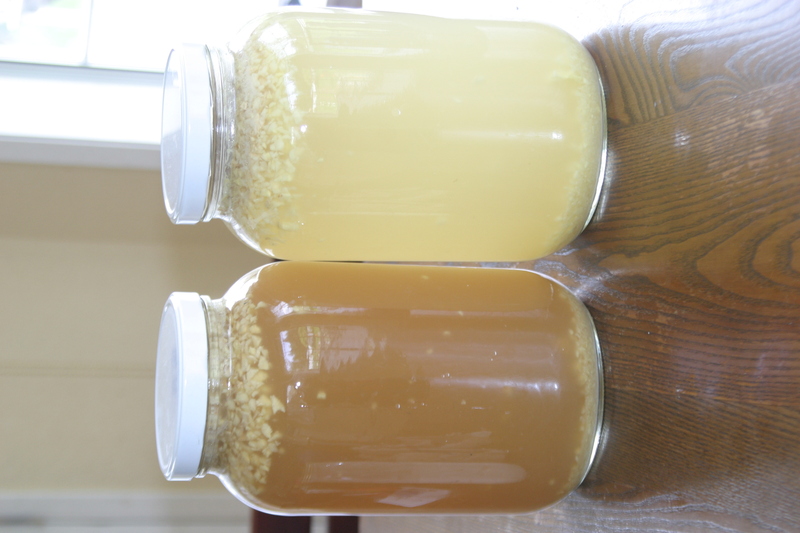 After about 8-12 hours at room temperature (longer if you are relying on airborne yeast), you should see the ginger pieces visibly churning in the liquid, with a large portion floating on the top. When that happens, it tells me it’s time to bottle. 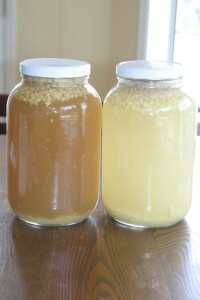 To bottle, I first filter out the ginger pieces by pouring the liquid through a sieve into another jar. It’s much easier to pour into beer bottles AFTER the pieces have been pulled out. I immediately seal the bottles, but leave them on the counter for another 2-3 hours to let the bottles get charged with carbonation. I like using flip-top bottles because I can pop one open to check the pressure and seal it back up again without having to replace a bottle cap. It is very important to get the bottles into the refrigerator at the right time, because you don’t want it too carbonated. Getting them cold stops the yeast from working more, and gives you more forgiveness when you open the bottles later on. Joel (then age 4) has a story of getting doused with half a bottle of ginger ale when he happened to be next to someone who opened a warm bottle of it on New Year’s eve. The brew has a good strong ginger bite to it, and I really enjoy a glass before meals. 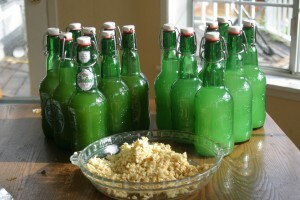 The bubbles are fun, the taste is great, and the ginger & enzymes help get the digestive juices going!